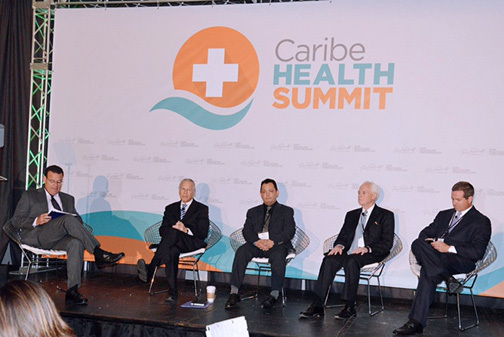 A panel discussion during last year's Caribe Health Summit. A panel discussion during last year’s Caribe Health Summit. The Caribe Health Summit, the most important medical tourism industry event of the Caribbean, will be held in Puerto Rico for the second consecutive year on June 9 at the Ritz Carlton Hotel. The event will serve as a platform for local medical tourism providers certified by the Medical Tourism Association (MTA) to present their offerings to the more than 40 international buyers expected to attend, organizers said. “Puerto Rico is advancing rapidly to position itself as one of the main medical tourism destinations of the Caribbean and Latin America. It is precisely through events like these that we have the unique opportunity to bring a large group of potential buyers of healthcare services to see firsthand the quality of our services, the academic credentials of our human capital and our medical installations,” said Medical Tourism Corporation Executive Director Francisco Bonet. The executive explained that the number of buyers attending the event is projected to double the amount of last year. He added that more than 40 entrepreneurs from Latin America, the Unites States mainland and Canada have already confirmed. Representatives from self insured companies, group service buyers, investors and healthcare providers are expected to participate. “Many of these buyers come from Panama, Colombia and the Dominican Republic, countries where we have commercial offices that play an important role at the time of providing a link with our local providers and offering up-to-date information about the destination,” said Bonet. The second edition of the Caribe Health Summit will also feature an important group of international speakers and experts that will discuss subjects such as global medical tourism trends, opportunities in medical tourism for the Puerto Rican medical diaspora, among others. Invited panelists include Lumin Health President and Founder Dr. Douglas Won, Health Flights Solutions President Anuja Agrawal and Dr. Steve Ullmann, professor and director of the Center for Health Sector Management and Policy at the University of Miami. The Caribe Health Summit will allow local healthcare entrepreneurs and providers to explore business opportunities in the tourism industry and the untapped potential in international healthcare alliances. Those interested in attending can register online through www.caribehealthsummit2016.eventbrite.com or by calling 787-641-2164. Hey Buddy!, I found this information for you: "Caribe Health Summit taking place in P.R. June 9th". Here is the website link: https://newsismybusiness.com/health-summit-taking/. Thank you.